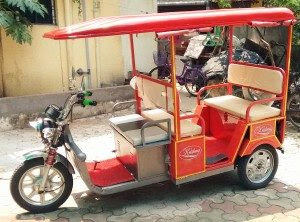 Krishna E Rickshaw is a brand of JP Corp. Krishna E Rickshaw are designed accordance with the industry laid standards and are offered as the cost-effective solutions to customers. These vehicles are easy to maintain and are Eco-friendly & fuel-efficient solutions, resulting in their wide demand across the nation. Their entire range is highly appreciated by customers owing to its strength, durability and ability to perform perfectly even under the harshest conditions. Price of Krishna E Rickshaw is around Rs.60000.